Early learning researchers and practitioners discussed how the state can improve early childhood education and care for all during EDU Talks: Raising Washington, presented by the University of Washington College of Education on March 28 at Seattle Children’s Museum. Watch each EDU Talk in its entirety below. Ariane Gauvreau, teaching associate in special education, discusses her research using images to help children with autism interact with their peers during snack time. Dawn Williams, a curriculum specialist with Cultivate Learning, discusses how to create environments that support high-quality early learning—without busting child care providers’ budgets. Holly Schindler, assistant professor of early childhood and family studies, discusses her work to strengthen fathers' parenting skills, using video highlights of what they're already doing well. What if … PD in your pocket? 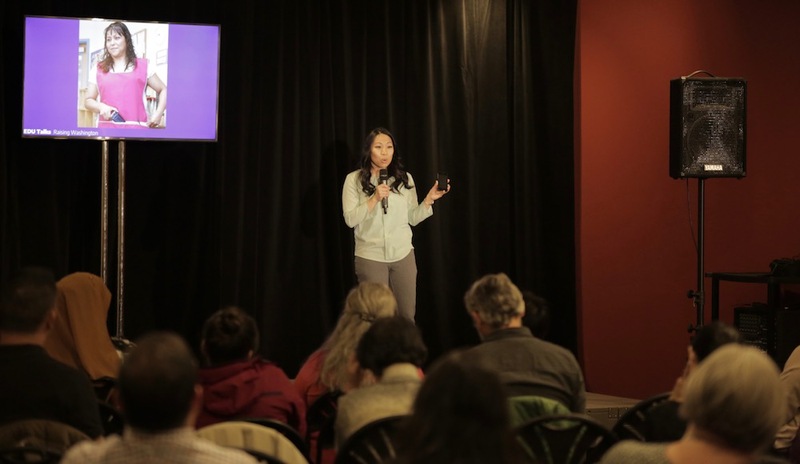 Virginia Tse, assessment lead for Early Achievers Ratings at Cultivate Learning, shares her work making professional development and early learning resources more accessible for Washington state's early learning providers. Soojin Oh Park, assistant professor of early childhood and family studies, shares how policymakers and educators can better support the growing number of immigrant and dual language learners in Washington. Asha Warsame, environment rating scale assessment lead at Cultivate Learning, discusses how we can build more culturally-responsive curricula for early learners and recognize what assets families bring. Amy Hale, director of education and volunteers at Seattle Children’s Museum, discusses how to make the most of informal and extended learning environments. The UW College of Education’s EDU Talks series features nationally-recognized researchers who partner with schools, communities and organizations to address the most pressing issues in education. Watch previous EDU Talks online.